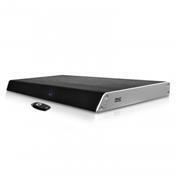 The Pyle Bluetooth TV Sound Base Speaker System enhances your home theater experience. This powerful yet compact sound base is designed to sit under your television -- and it's super easy-to-setup & easy-to-use! Built-in Bluetooth allows you to wirelessly stream audio from all of your favorite devices (like Smartphones, Tablets, Laptops, Computers, etc.). It also connects to your HDTV thanks to the rear panel HDMI connectors. The sound base features exceptional stereo sound reproduction technologies that effectively recreate the entire audio spectrum in a compact, form-fitting space. Full range audio is created thanks to the high-powered dual 5.0'' ported enclosure subwoofers and four 1.5'' speakers, all made for adding rich sounds to your next movie night! Let Pyle improve your audio & multimedia experience by adding clean and simple style -- with next-generation sound technology. Upgrade your home theater entertainment system with the Pyle Bluetooth TV Sound Base Speaker System. * Maximum TV Holding Capacity: 110.0 lbs.